Dom Barrow will make his Saints debut in Saturday's Challenge Cup clash with Clermont Auvergne at Franklin's Gardens (kick-off 3pm). 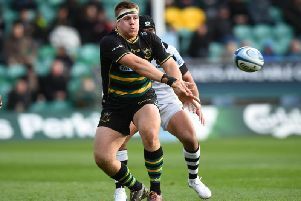 Barrow's first appearance in black, green and gold has been delayed by injury, with concussion and a hamstring injury hampering the former Leicester Tigers lock. But he is now back to full fitness and thrown straight into the second row, with Saints depleted by injuries in that department. Barrow has only played one game in Northampton colours so far as he lined up in a pre-season win at Ospreys. He has not even been able to feature for the Wanderers, but with Api Ratuniyarawa (ankle) and Courtney Lawes (back) on the injured list, Barrow gets his chance. Another summer signing, James Haskell, is also handed a start as he replaces Jamie Gibson in the back row. Ahsee Tuala has recovered from the bang to the knee he sustained in the 23-15 Gallagher Premiership defeat to Leicester Tigers at Twickenham last weekend. And Piers Francis returns from concussion to line up at inside centre, replacing Luther Burrell, who is on the bench. Taqele Naiyaravoro drops out of the matchday squad as he is given a rest after a hectic start to life at his new club. Tom Collins replaces the powerhouse wing. Meanwhile, Clermont, who currently lead the way in the Top 14, have signalled their Challenge Cup intentions by picking an extremely strong side to face Saints. It includes the likes of Rabah Slimani, Greig Laidlaw and Damian Penaud.